Click here to download technical information. Power and Free conveyors are exactly as the name implies, a powered chain driving a form of free track trolley underneath itself. The 406/406 Power and Free conveyor consists of two sets of 406 track one directly beneath the other. 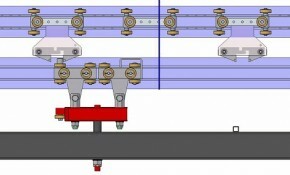 The top track contains the powered chain as standard 406 but instead of a hanging pendant it has a latching drive dog which engages with 406 Free Track trolleys in the track section underneath. Single trolley can take a product of 250Kg but multiple trolley and loadbar arrangements can take up to 1000Kg. Towing dogs will carry the trolleys around the circuit length of a system until it comes in contact with a blade stop; at this point the dog disengages and carries on its journey around the circuit. The free track part of the system may now divert away onto different lines for cooling or storage without causing a stop in the powered circuit. Indexers and rotators can be applied directly to trolleys and loadbars for precision coating or treatment. 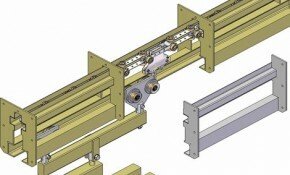 These can be manipulated manually or automatically by incorporating pneumatics or electrical controls. Similar to any overhead, the track can either be supported by floor mounted steelwork or roof supports if applicable.